Funny. My parents used to watch every episode of Lawrence Welk when we were growing up. Also, those musicians are pretty good. LOL, @Ferret/John: Too funny, if you get my drift. @ Pierre: My parent's had just settled down for the night to watch the "Welk" show the evening of my 28th birthday when my dad had a heart attack, his final one. Here is even an older version of the song. The violin player in the middle is playing a 'Strad'. Very sorry to hear it Ken. The recording doesn't do the Strad much justice. 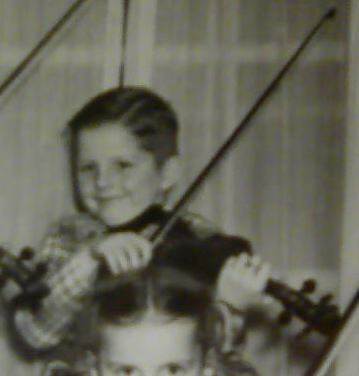 Lawrence Welk liked his playing so much that he bought him that Strad when he joined the LW show in 1953. Here's another song on the Strad. Why can't I find a boss like him.